This guide shows how to get started with the ESP-WROVER-KIT V4.1 development board and also provides information about its functionality and configuration options. For the description of other ESP-WROVER-KIT versions, please check ESP32 Hardware Reference. ESP-WROVER-KIT is an ESP32-based development board produced by Espressif. Its another distinguishing feature is the embedded FTDI FT2232HL chip - an advanced multi-interface USB bridge. This chip enables to use JTAG for direct debugging of ESP32 through the USB interface without a separate JTAG debugger. ESP-WROVER-KIT makes development convenient, easy, and cost-effective. Most of the ESP32 I/O pins are broken out to the board’s pin headers for easy access. ESP32’s GPIO16 and GPIO17 are used as chip select and clock signals for PSRAM. By default, the two GPIOs are not broken out to the board’s pin headers in order to ensure reliable performance. The block diagram below shows the main components of ESP-WROVER-KIT and their interconnections. The following two figures and the table below describe the key components, interfaces and controls of the ESP-WROVER-KIT board. FT2232 The FT2232 chip serves as a multi-protocol USB-to-serial bridge which can be programmed and controlled via USB to provide communication with ESP32. FT2232 also features USB-to-JTAG interface which is available on channel A of the chip, while USB-to-serial is on channel B. 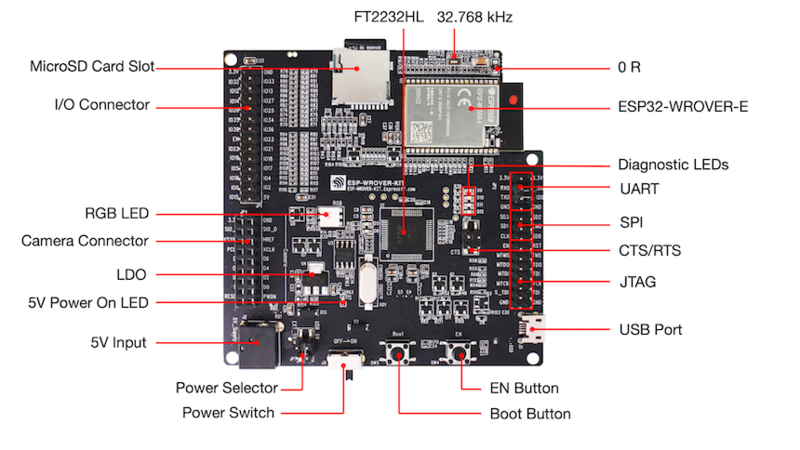 The FT2232 chip enhances user-friendliness in terms of application development and debugging. See ESP-WROVER-KIT V4.1 schematic. 32.768 kHz External precision 32.768 kHz crystal oscillator serves as a clock with low-power consumption while the chip is in Deep-sleep mode. 0R Zero-ohm resistor intended as a placeholder for a current shunt, can be desoldered or replaced with a current shunt to facilitate the measurement of ESP32’s current consumption in different modes. ESP32-WROVER This EPS32 module features 64-Mbit PSRAM for flexible extended storage and data processing capabilities. Diagnostic LEDs Four red LEDs connected to the GPIO pins of FT2232. Intended for future use. UART Serial port. The serial TX/RX signals of FT2232 and ESP32 are broken out to the inward and outward sides of JP2 respectively. By default, these pairs of pins are connected with jumpers. 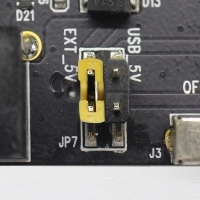 To use ESP32’s serial interface, remove the jumpers and connect another external serial device to the respective pins. SPI By default, ESP32 uses its SPI interface to access flash and PSRAM memory inside the module. 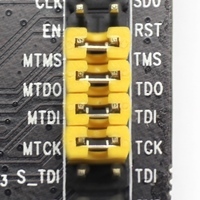 Use these pins to connect ESP32 to another SPI device. In this case, an extra chip select (CS) signal is needed. Please note that the voltage of this interface is 3.3V. CTS/RTS Serial port flow control signals: the pins are not connected to the circuitry by default. To enable them, short the respective pins of JP14 with jumpers. JTAG JTAG interface. JTAG signals of FT2232 and ESP32 are broken out to the inward and outward sides of JP2 respectively. By default, these pairs of pins are disconnected. To enable JTAG, short the respective pins with jumpers as shown in Section Setup Options. USB Port USB interface. Power supply for the board as well as the communication interface between a computer and the board. Power Switch Power On/Off Switch. Toggling toward the Boot button powers the board on, toggling away from Boot powers the board off. Power Selector Power supply selector interface. The board can be powered either via USB or via the 5V Input interface. Select the power source with a jumper. For more details, see Section Setup Options, jumper header JP7. 5V Input The 5V power supply interface can be more convenient when the board is operating autonomously (not connected to a computer). 5V Power On LED This red LED turns on when power is supplied to the board, either from USB or 5V Input. LDO NCP1117(1A). 5V-to-3.3V LDO. NCP1117 can provide a maximum current of 1A. The LDO on the board has a fixed output voltage. Although, the user can install an LDO with adjustable output voltage. For details, please refer to ESP-WROVER-KIT V4.1 schematic. Camera Connector Camera interface, a standard OV7670 camera module. RGB LED Red, green and blue (RGB) light emitting diodes (LEDs), can be controlled by pulse width modulation (PWM). I/O Connector All the pins on the ESP32 module are broken out to pin headers. You can program ESP32 to enable multiple functions, such as PWM, ADC, DAC, I2C, I2S, SPI, etc. Micro SD Card Slot Useful for developing applications that access Micro SD card for data storage and retrieval. LCD Support for mounting and interfacing a 3.2” SPI (standard 4-wire Serial Peripheral Interface) LCD, as shown on figure ESP-WROVER-KIT board layout - back. There are three jumper blocks available to set up the board functionality. The most frequently required options are listed in the table below. Some pins / terminals of ESP32 are allocated for use with the onboard or external hardware. If that hardware is not used, e.g., nothing is plugged into the Camera (JP4) header, then these GPIOs can be used for other purposes. Some of the pins, such as GPIO0 or GPIO2, have multiple functions and some of them are shared among onboard and external peripheral devices. Certain combinations of peripherals cannot work together. For example, it is not possible to do JTAG debugging of an application that is using SD card, because several pins are shared by JTAG and the SD card slot. In other cases, peripherals can coexist under certain conditions. This is applicable to, for example, LCD screen and SD card that share only a single pin GPIO21. This pin is used to provide D/C (Data / Control) signal for the LCD as well as the CD (Card Detect) signal read from the SD card slot. If the card detect functionality is not essential, then it may be disabled by removing R167, so both LCD and SD may operate together. For more details on which pins are shared among which peripherals, please refer to the table in the next section. The JP1 connector consists of 14x2 male pins whose functions are shown in the middle two “I/O” columns of the table below. The two “Shared With” columns on both sides describe where else on the board a certain GPIO is used. 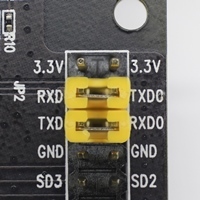 Since GPIO32 and GPIO33 are connected to the oscillator by default, they are not connected to the JP1 I/O connector to maintain signal integrity. This allocation may be changed from the oscillator to JP1 by desoldering the zero-ohm resistors from positions R11 / R23 and re-soldering them to positions R12 / R24. The module’s flash bus is connected to the jumper block JP2 through zero-ohm resistors R140 ~ R145. 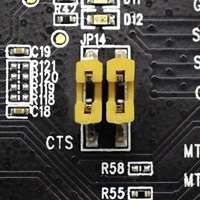 If the flash memory needs to operate at the frequency of 80 MHz, for reasons such as improving the integrity of bus signals, you can desolder these resistors to disconnect the module’s flash bus from the pin header JP2. Before powering up your ESP-WROVER-KIT, please make sure that the board is in good condition with no obvious signs of damage. 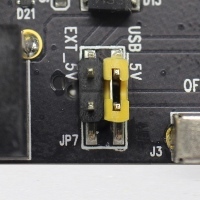 Select USB as the power source using the jumper block JP7. Enable UART communication using the jumper block JP2. Turn the Power Switch to ON, the 5V Power On LED should light up. Please proceed to Get Started (CMake), where Section Installation Step by Step will quickly help you set up the development environment and then flash an example project onto your board.